A necessary aspect of pond construction is the removal of dirt and other material, which is known as excavation. However, while this may seem like Ponds 101, there is a lot more involved than merely using a shovel or backhoe to dig a large hole. While many people try to perform the digging themselves in order to save money, there are a number of benefits you’ll gain by hiring a professional. Aside from saving you time and not having to get your hands dirty, there are a number of other benefits which are gained by simply hiring a pond pro for pond excavations. Many pond builders will want to perform every aspect of the project themselves. There are various nuances of pond excavation that novices won’t be familiar with, such as shaping, level and depth, and professionals also understand the importance of structural integrity. Some areas may have to be refilled, which will increase the project’s cost. While anyone is capable of digging a hole in the ground, only a professional can excavate it in a manner that is suitable for a pond. Many people are confused about the differences between digging and excavation, particularly when it comes to pond construction. Digging a hole in the ground requires no skill, no planning, and is often rushed and haphazard. Excavation, on the other hand, requires good planning, tactics, equipment and strategy. For instance, before performing an excavation professionals will first think about how the dirt and other material they remove can be efficiently put to use. When an excavation is performed various materials will be uncovered, and these different materials can be utilized at later stages of the project. It is also important to understand that pond construction, at the end of the day, is a type of art akin to architecture. This means that there is a creative component involved that only those with skill and experience can manage. Putting tunnels, caves, planting areas and shapes into the right places, at the right depth and with the correct structural integrity are a skillset that few amateurs possess. With quality excavation the pond will look great on the outside and inside. The pond’s final depth will be structured in such a way where it has utility depressions as well as spots for cleanout pits, as well as planting pockets. The interior of a pond’s installation must be superb and above all else it must showcase style. By allowing the pond builder to excavate your land themselves instead of trying to do your own digging to save a buck, the excavator will come to know the land intimately and will be able to perform future adjustments and maintenance if and when any problems occur. Another crucial component of pond excavations is drainage and filters. 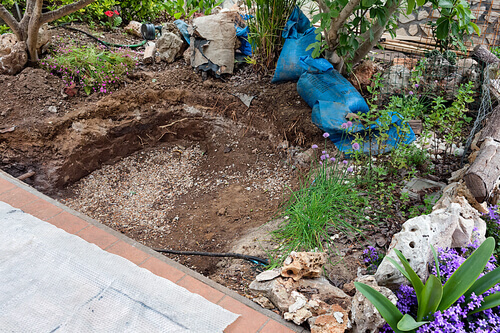 When the excavation process is carried about by a professional they will plan for the installation of filter systems as well as waterfalls and streams. These systems must flow and connect together correctly, and as you can see, this all involves much more than merely digging a hole in the ground.